I took a walk in my garden today; it was a gorgeous, hot, sunny day. I would like to share with you three photographs of special spots that captured my eye…and my heart. 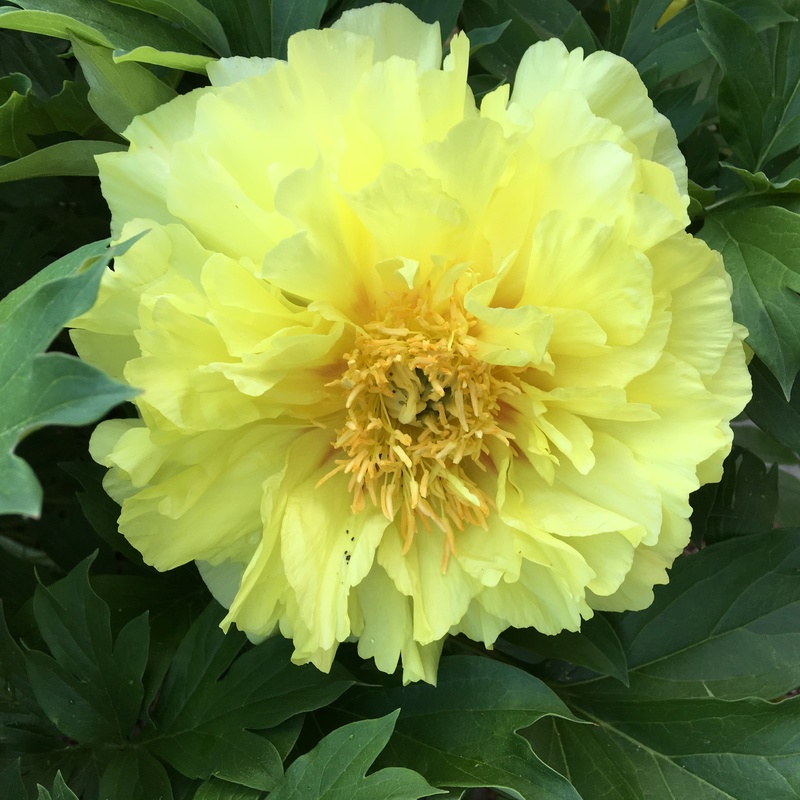 Itoh peonies are crosses between herbaceous peonies and tree peonies. They have huge blossoms (this one is over 7 inches across), they stand up in wind and rain, and they last longer than their herbaceous sisters. Nothing in my garden elicits more raves than ‘Bartzella.’ They are still expensive but worth every penny. You may want to visit peony@peonysenvy.com to see examples of Itoh peonies that are available. 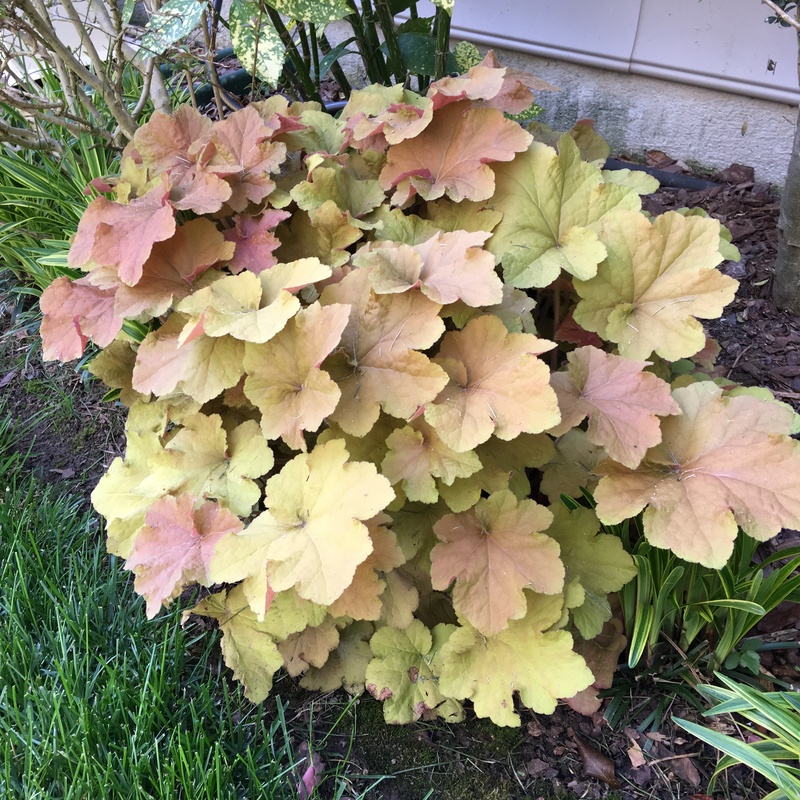 Heuchera villosa ‘Caramel’ is arguably the most popular heuchera in garden centers in our area. This one has been in the ground for over six years. In late winter I remove last years foliage, and the new growth is fresh and beautiful. It will put up stalks of tiny flowers later in the year, but I don’t care; I just love the foliage. I have four clumps of ‘Caesar’s Brother’ in my garden, and when they are in bloom, it is hard to look anywhere else. The four large clumps have all come from divisions over the years from a “parent” clump in my Chapel Hill garden several decades ago. My Arranger helps me deadhead them, and then I cut them back in fall. And that’s it; I don’t have to do anything else but smile and watch them grow. Plants like these three are what makes gardening such a joy and blessing. This entry was posted in Gardening and tagged Bartzella Itoh peony, Heuchera villosa Caramel, Iris sibirica Caesar's Brother. Bookmark the permalink. All three of these beautiful plants are winners! I”m delighted that you like them. They are all beautiful, no wonder you like them so much! Thanks, Pauline. These are clearly some of my favorites which makes this time of year so special. Great choices John. The Heuchera is an amazing colour. Would look great in a shady part of my garden, but I haven’t seen it offered here. I certainly hope you can find a source for the heuchera. They are easy to deal with and lovely. Whoa – that’s some Peony. Love the color. Nice stand of Siberian Iris, also. Thanks, Jason. For us in NC it’s a magical time of the year. 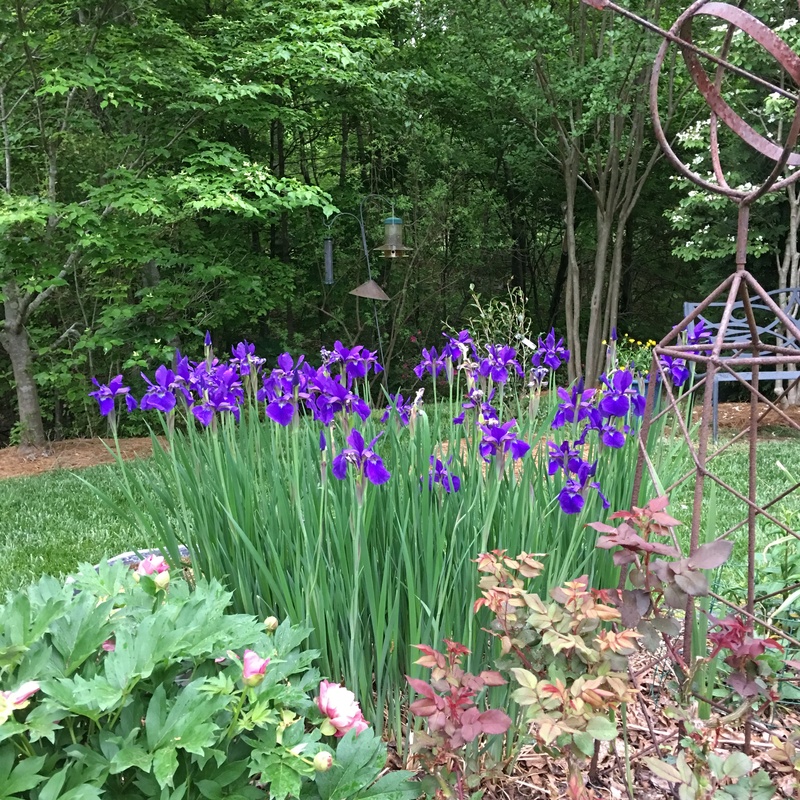 The peonies are fantastic, but I think blue Siberian iris are some of the most beautiful flowers in the world. So elegant! Glad to hear from you, Suzy.. Whatever you wanted to send didn’t make it, so please try again. I hope you and your fellow painters will be able to return to the garden this spring. What a lovely way to share your garden! It’s all about sharing treasures we have … beautiful memories!